Leaders notably included European Commission’s Director-General for Environment, CEOs and top managers from AT&T, AXA, BNY Mellon, Euroclear, ERT, FedEx Express, ManpowerGroup, Sage, SAP, SAS and The Parliament Magazine’s Managing Editor. Leaders-for-a-Day is designed to offer further opportunities to students who completed the JA Company Programme and obtained the Entrepreneurial Skills Pass TM (ESP), a unique certification of their entrepreneurial skills, knowledge and attitude. 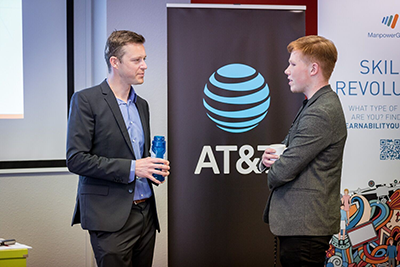 This 2018 edition in cooperation with digital experts AT&T and supported by ManpowerGroup also invited young participants from the AT&T Aspire mentoring programme in Europe. This experience aims to inspire young people to be entrepreneurial and encourage mentoring between young people and experienced professionals. It additionally helps them expand their network and better position themselves to enter the labour market. Studies have shown that students who have contact with employers while in school are more likely to be employed and 3-6 times less likely to be jobless. At the end of the day, students and leaders shared their experiences during a celebration dinner in the presence of the JA Europe Board of Directors. Author Larry Farrell closed the celebration with a presentation of his new book “The Entrepreneurial Attitude” for which he interviewed seventy high-achieving JA alumni across the world.